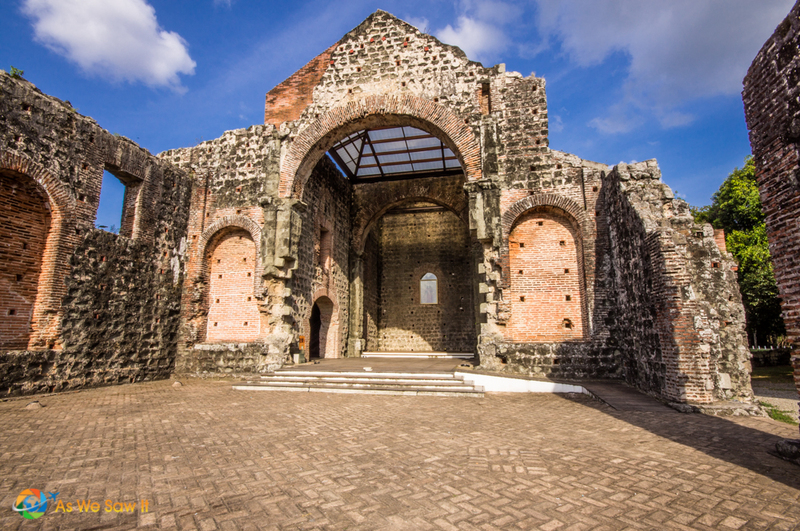 Today we are strolling through Casco Viejo, the oldest part of Panama City. Its brick paved streets make you feel like time has warped and you’ve stepped back into an age where life was much simpler and details were more fascinating. 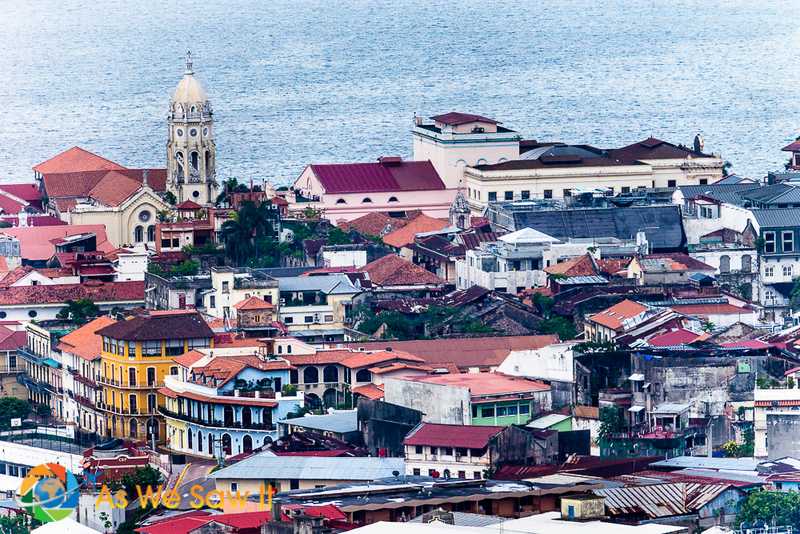 The bright colors, wrought iron and bold arches of Casco's Spanish architecture give such a warm appearance that they match that of the people living here. There are so many shops and restaurants in this area that one could spend two weeks in Casco Viejo and not eat at the same place twice. 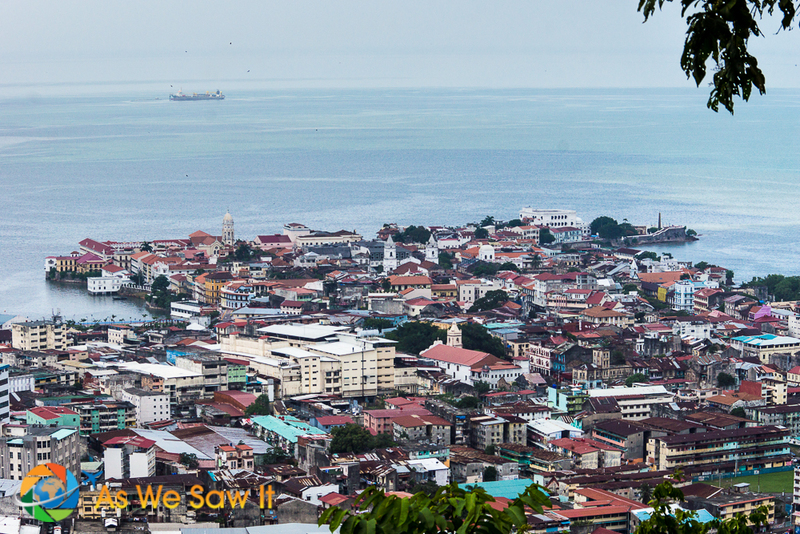 We found a place on a roof top with spectacular views of both the old Casco and new modern metropolis Panama City. 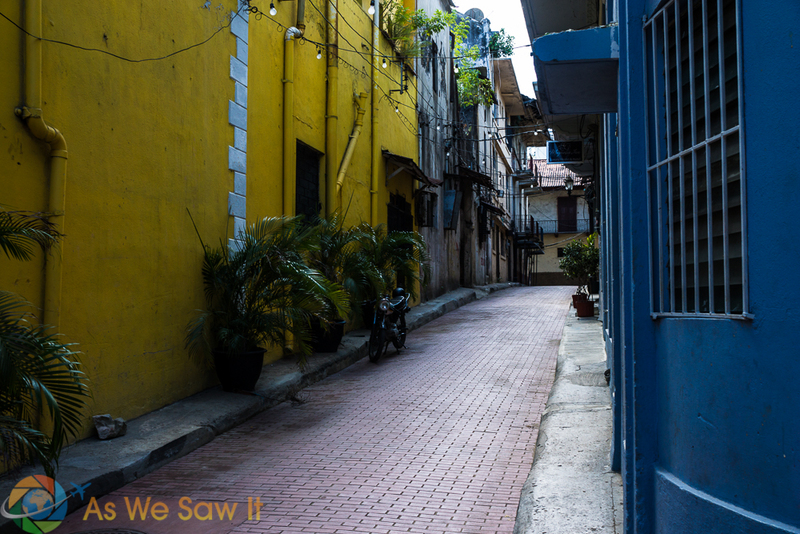 Brick streets and bright colors are the norm in Casco. Market tucked into a ruined building attracts many souvenir hunters. 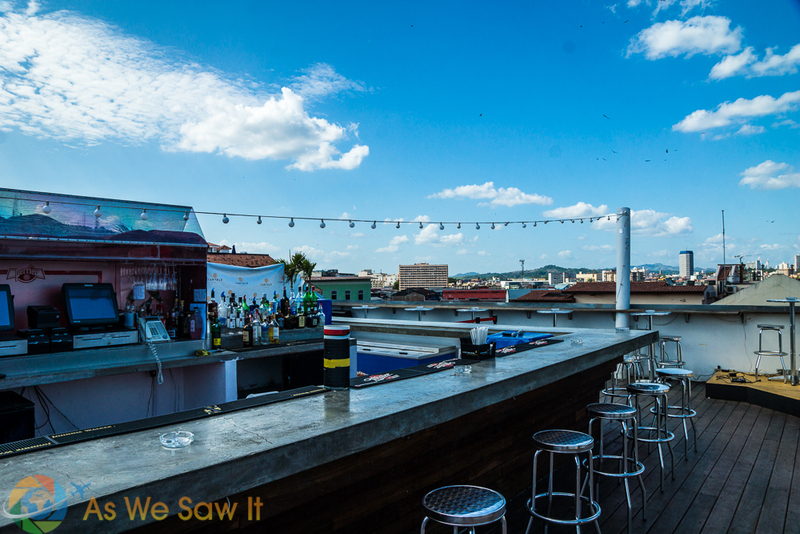 Rooftop bar offers views and booze. Contrasting views of old and new from your table. As you look about, the culture and character of the people are displayed in the lives and crafts around you. Children play in the streets with the simplest of toys, while around the next corner a local dressed in the national dress is proudly walking towards a festival. 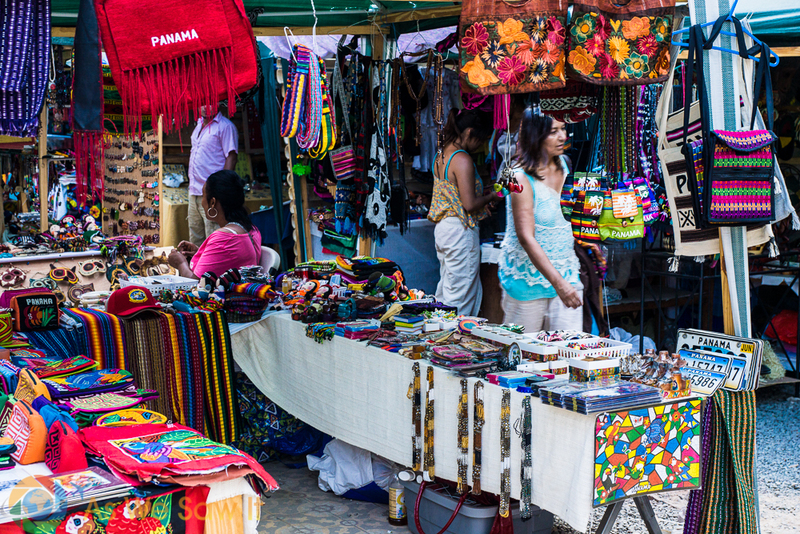 Arts and crafts tell of the history of these people who now make up the Panamanians whom we have come to know and love. 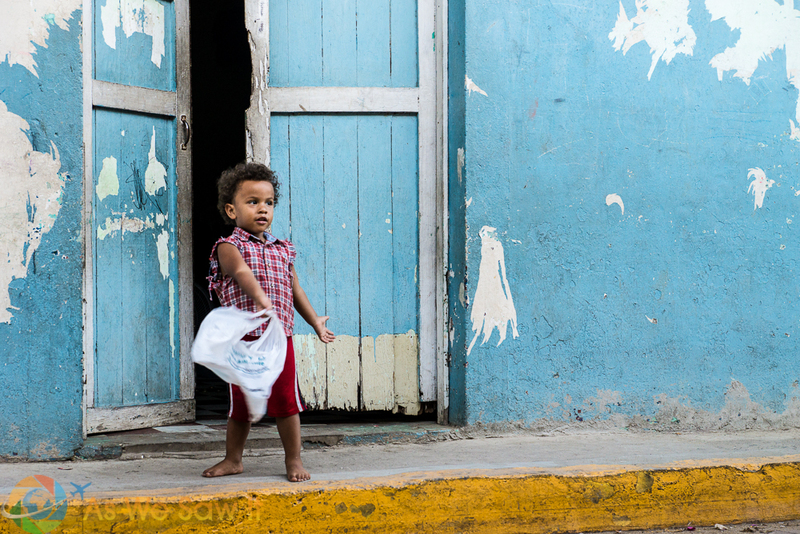 Little boy playing with a plastic bag in Casco Viejo. Lady wearing la pollera, the traditional Panamanian costume, for a local festival. 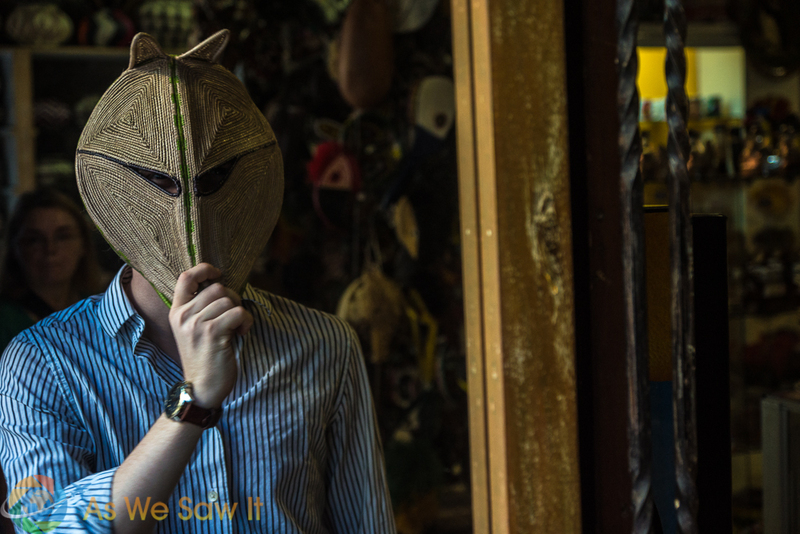 Masks made by the indigenous Emberá tribe are available at souvenir shops in Casco. 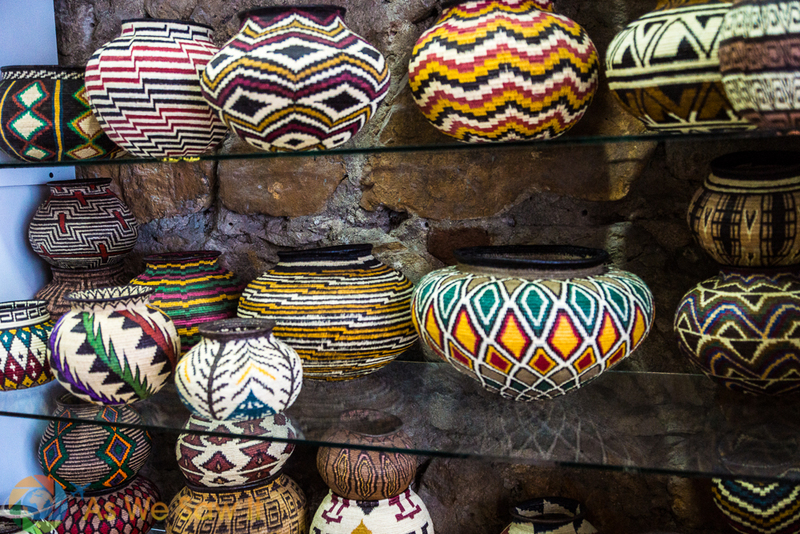 Baskets from the Embará tribe can be woven tightly enough to hold water. 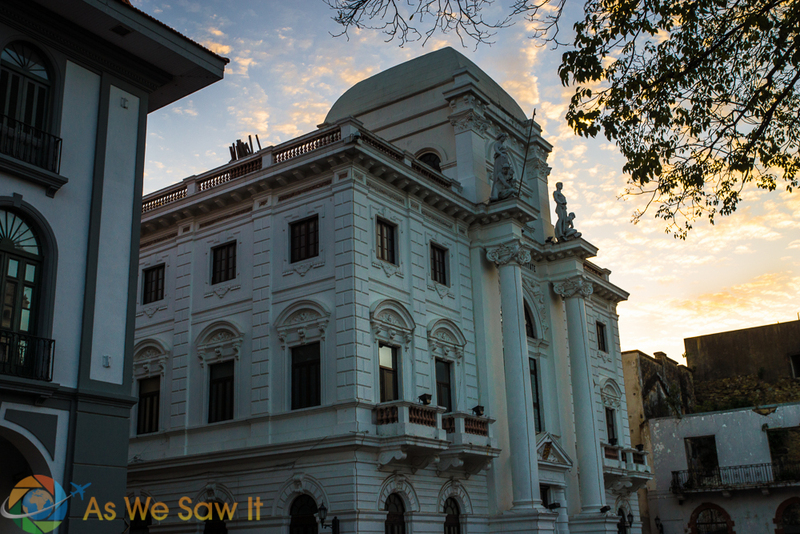 It seems wild as the contrasting views of old and new come together here in Casco Viejo, especially knowing its history. 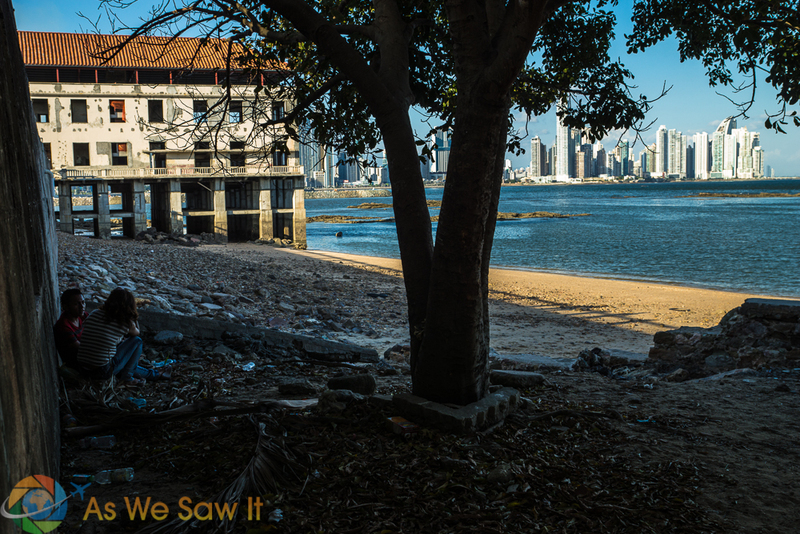 Panama City is actually a tale of three cities with birth, disaster and recovery to final world-wide glory. 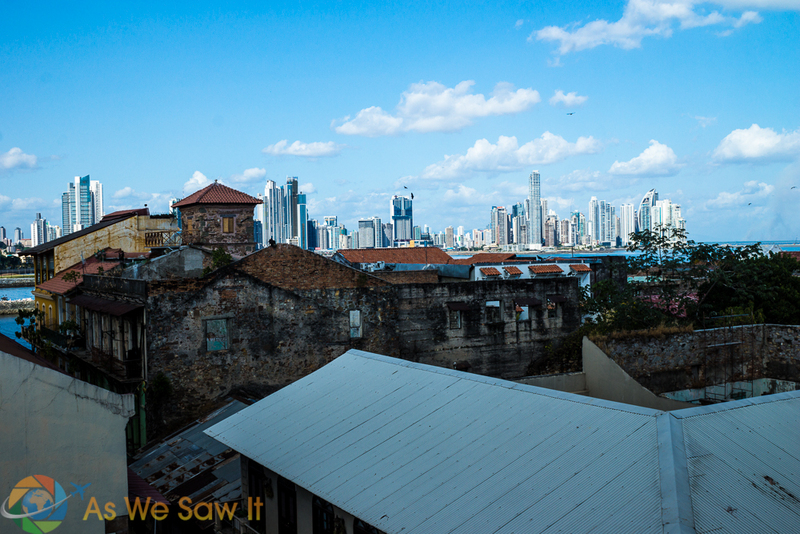 Panama Viejo (old Panama) is the oldest of the settlements and sacked by Captain Morgan in the 1500’s. 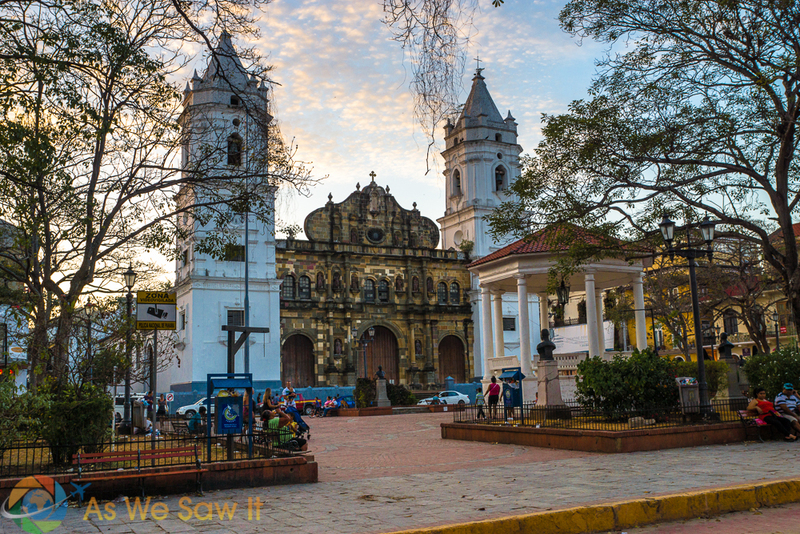 Tale of 3 cities: Original Panama City now known as Panama Viejo, dates from the 1500's. The survivors relocated to a more defensible location on a small peninsula jutting out into the Pacific Ocean, and this is today's Casco Viejo. Or Casco Antiguo. Take your pick. Finally, the modern day city, with buildings touching the clouds, is a full display of abundance and victory as any other modern city in the world. Panama has burst upon the world financial scene, completely overcoming the disasters of her past, to now be called the Singapore of the West. Tale of 3 cities: Modern day Panama City and its financial district. 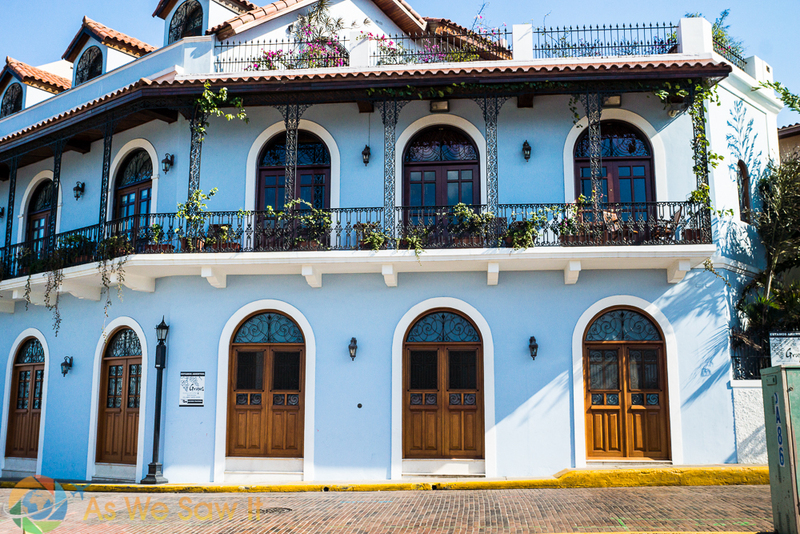 Beautiful architecture as the sun set for the day on Casco Antiguo, Panama City, Panama. 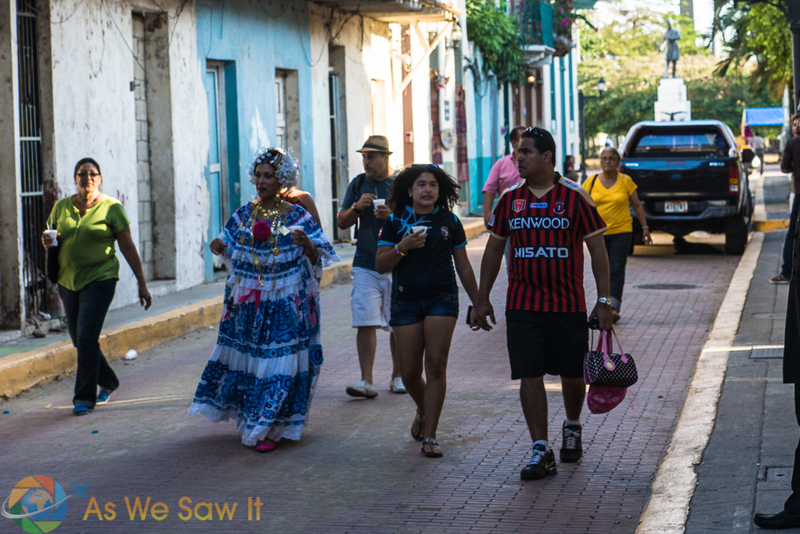 Yes, we love Panama City and especially Casco Viejo. I had no knowledge of this interesting history of Panama City or that it had such a large modern urban area. Fascinating! It is quite modern. Panama City now has a state-of-the-art subway as well. 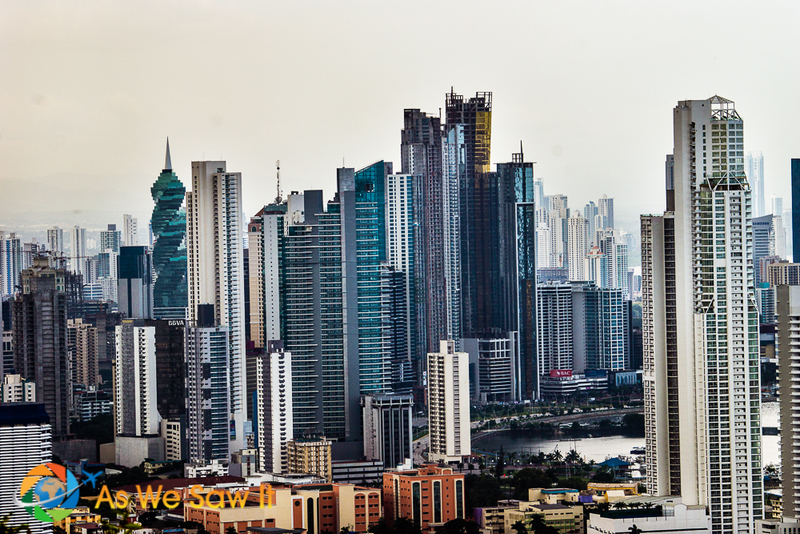 Wow, I had no idea that Panama had such an interesting history – or such an incredible skyline! I really love that shot showing the juxtaposition between the old and the new. It looks like a really colourful place. Thanks for the compliment about Dan’s photography, John. We were surprised by Panama as well. Casco Viejo’s architecture looks very much like Mexico City, not surprisingly. I love these little “barrios” where time seems to have stopped and people still live a peaceful life. Panama City looks very colorful and pretty. Haha – yeah, those Spaniards left their mark wherever they went! We have a weakness for those old cities that time forgot. I guess that’s one reason we love Europe so much. I love Panama’s Casco Viejo. You photos remind me so much of my own stroll thru thru the narrow streets. I think I love this place so much because it reminds me a lot of Old San Juan, the place I visited so many times when I was a kid. The new part of town has changed a lot since I visited. I do not recognize a lot of the buildings in the skyline. Casco Viejo is changing a lot as well; the streets have been re-bricked and lots of people are restoring the old buildings. We anticipate that it will be as pretty as Cartagena, Colombia in a few years. Would love to explore this beautiful city. Lovely, evocative pictures.